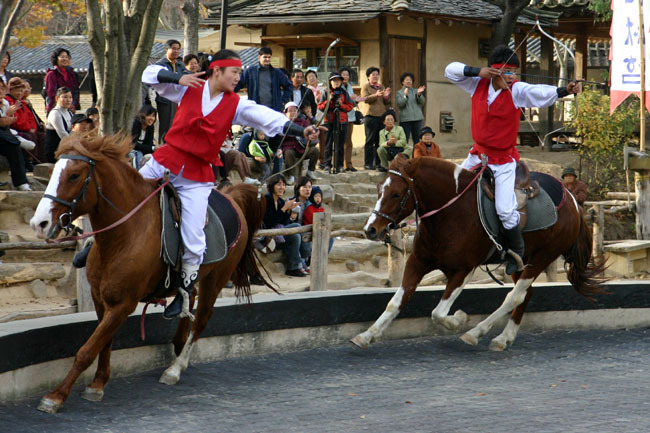 Horseback Archery In Korea: A Traditional Sport. Over the past couple of decades archery from the back of a horse has seen a revival as a sport and recreational activity. Countries all around the world, both those with and without a tradition of the practice, have started holding competitions and displays of this challenging and very watchable sport. Korea, which has a long history of archery use, is one of the leading advocates and practitioners of the sport. One of the earliest images of horse archery in Korea is from the Three Kingdoms Period when ‘Korea’ was much larger, and held land further into what is nowadays China. The wall murals in Muyongchong Tombs in Goruryeo (now in China) date from the 5th century CE and show scenes of everyday life for the rich. 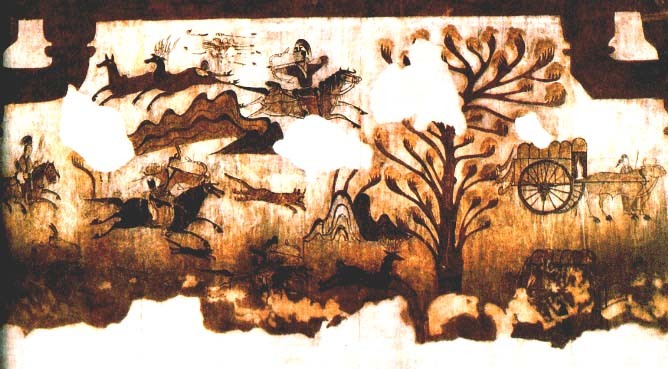 The fact that one panel shows men hunting deer and tigers means that it was an important aspect of their lifestyle. The mural shows skilled archers riding expertly after their quarry. I have no doubt that horse archery had been practiced in this region long before this mural was painted since it is shown as an aristocratic pastime. Other murals in the tomb show activities such as dancing and dining in keeping with the entertainment theme. Although only the rich and the military could afford to keep and train horses, hunting from horseback no doubt evolved from the need, by nomadic peoples and traveling armies, to hunt for food while on the move. Hunting from horseback not only provided food and furs etc, it helped build skills for warriors, as well as being an enjoyable pastime for the wealthy. Owning a horse, paying for its upkeep, outfitting it, and training it was beyond the reach of the average person in most cultures.The image below is from an ancient tomb in Dukheung-ri and shows a horseback archery competition, which without wealth and leisure time would have been an unlikely pastime for any but the military, or the rich. The Samguk Sagi, published 1145 CE, chronicles many aspects of Korea’s even earlier past using historic records and sources, some of which are lost to us today. In it there are accounts from the Three Kingdoms Period, (57 BCE – 668 CE) with one from Baekje stating that being good at horseback archery was a good thing and an important criteria for evaluating a warrior, or king’s prowess in feats of arms. 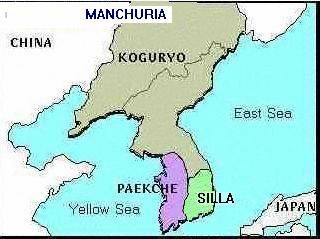 It also notes that in Shilla government officials took part in horseback archery competitions with prizes being awarded by the King, and that in Goguryeo hunting competitions were held every Spring and Fall with winners being able to advance to being a ‘brave warrior’. Horse archery continued to be an important part of Korea’s history and culture, with some ups and downs in popularity, right up until the arrival of westerners and their weapons to the then ‘hermit’ kingdom. The 19th and 20th centuries saw many once important aspects of Korea’s heritage fade away due to many outside factors and influences, including the Japanese occupation of 1910-1945. Fortunately Korea has been working hard to restore and revive many of its’ ancient traditions. We know that horseback archery in Korea can be definitively be proved to date back at least 1,500 years, with a high probability that it dates back to a much earlier time, but its’ resurrection only dates from around the late 1990’s when a display of ‘Mogu’ (aiming at a moving target pulled behind another horse) took place at a Korean Military Academy. It wasn’t until 2004 that the 1st Hwarang horseback archery competition took place, and 2005 for the first International Competition. 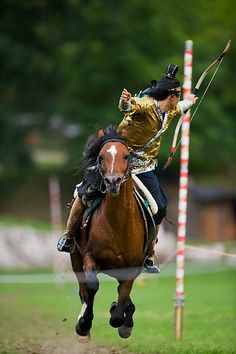 As stated earlier many countries and cultures have a history of horseback archery and quite a few of them are a part of the modern revival of the sport. Some countries began their own revivals of the sport at various times during the past century, but it has only been since the turn of this century that there has been an ever increasing interest in the sport. There are two main styles that are most often seen in competition, the Korean, and the Hungarian, although nowadays events are held in many places with their own courses and challenges. It is hard to compete in international competitions due to the expenses involved in transporting horses long distances, however regional competitions are becoming more common. If you can’t get to Korea to see horseback archery try finding an event near your location. Supporting horseback archery anywhere in the world helps the sport grow and expand. Archery from horseback is an ancient skill that deserves to be nurtured and allowed to survive well into our future. Countries such as Korea are recognizing it as part of their intangible cultural heritage and are taking steps to try and preserve it. Some Folk Villages and tourist destinations have horseback archery shows that you can watch, and more Sageguk and historic Kdramas are showing horseback archery as more young people are learning the skill. If you want more information on the modern sport you can check out www.whaf.net or www.horsebackarchery.info as well as multiple other online sites. There are also many videos on Youtube about the sport. Category: Games, History, Korean Culture, KPOP, Odds and Ends. ← Halla Arboretum, Jeju Island.